A lone, black candle burns against a black background as we join a séance in progress. The camera pans over the anxious faces of the circle of believers. A soft, reassuring voice breaks the silence. 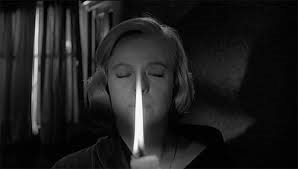 The medium, Myra Savage (Kim Stanley) soothes the unruly spirits. After the séance, the faithful step outside, blinking at the daylight and we meet the players. Myra and her husband, Billy switch on the lights to reveal a room full of overstuffed chairs and bric-a-brac. Shabby and overdone, it looks as if it’s been stuck in time for fifty years. As dominant, unbalanced Myra goes on and on about her ‘gift’ we see the weak-willed Billy. He listens to her quiet ramblings with the resignation of a beaten man. As the two discuss their history, Myra belittles Billy, not coarsely, but softly and gently with a sweet lilt in her pretty voice. Amid the ‘yes dears’ and ‘you’re probably rights’, we see that Billy kow-tows to Myra, but she’s dependent on him as well. Constantly seeking reassurance, Myra makes Billy tell her over and over that he needs her and loves her. These two quiet, middle-aged people have a plan. You see, for years Myra has held her weekly spiritual meetings for pitiful pay and even less recognition. She craves attention and the means to pull herself out of her drab environment. They plan to commit a crime. Myra will use her psychic powers to solve it thus cementing her reputation as a medium and gaining them some spending money. It’s clear that Myra’s plan doesn’t sit well with Billy and he tries weakly to talk her out of it. Myra can’t be moved and the story begins. Their detailed scheme is set in motion as Billy goes out and Myra dispenses instructions from home. Even after the first part of the crime goes off without a hitch, Billy has reservations and the strain of it shows on his face. As the pair dive deeper into their twisted conspiracy, it’s clear that the plot, their marriage, and her sanity rests on a house of cards doomed to collapse. 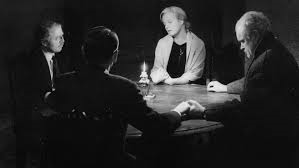 Bryan Forbes (The Stepford Wives) directs Séance on a Wet Afternoon subtly with a slow, but deliberate pace that gives Stanley and Attenborough room to show off their prodigious talents. The dialogue sounds natural and the two experienced character actors paint us a picture of an immature, possibly mad woman and the compliant, dependent man who indulges her. The duo work in shades of gray allowing Myra and Billy to experience a range of emotions and pull us into their strangely touching relationship. Stanley and Attenborough are all restraint and give beautifully nuanced performances. Both were nominated by the BAFTA (British Academy of Film and Television Arts). Attenborough won. The Academy nominated Stanley and she won both the National Board of Review and the New York Film Critics’ Circle best actress awards. Forbes was also nominated for a BAFTA award for his screenplay based on Mark McShane’s novel. 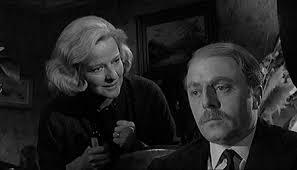 Gerry Turpin’s cinematography was also BAFTA nominated and deservedly so. 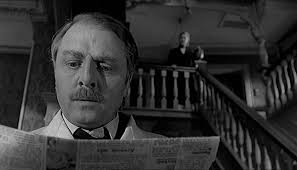 The gorgeously shot black and white film has a look that screams 1960s Britain. 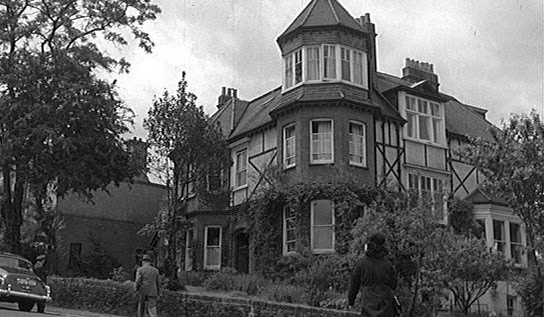 Turpin contrasts the bleak English countryside and the dull interior of the couples’ home with the clean, modern home of the rich victims of their heinous crime. Forbes and Turpin chose beautiful tableaux to film and spend time there. There are no jump cuts. 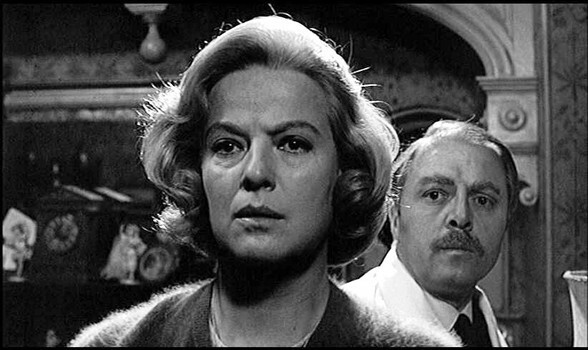 The suspense comes from the framing of the story and the understated performances of the two leads and the veteran actors like Patrick Magee, Mark Eden, Nanette Newman, and Gerald Sim working with them. This house, you have to watch it every minute. Wait, wrong movie. The music and sound effects heighten the suspense as well. 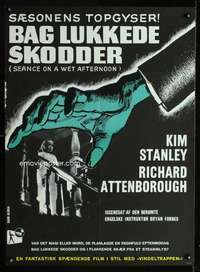 Much of the film has no music which accentuates the suffocating stillness of the Savage home. The sounds of nature coupled with John Barry’s (Yes, THAT John Barry!) spare score add to the quirky eeriness of this dark tale. 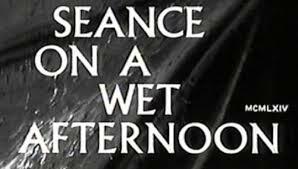 I recommend Séance on a Wet Afternoon. 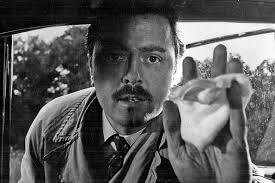 It’s a chilling character study that makes me want to see every British film of this era. One of the primary influences on my novel White Rabbit! Love this film. Me too! I just read about White Rabbit. I like the idea of the real/fake psychic too. Super review! I really enjoyed watching this with you on TCM! And I can’t believe I didn’t recognize Forbes’ name. I’m a huge Stepford Wives fan! Thank you! It was fun. He isn’t as well known as some directors, but he’s made some terrific films. Thanks again for reading!